On Sale Now! Free Shipping Included! 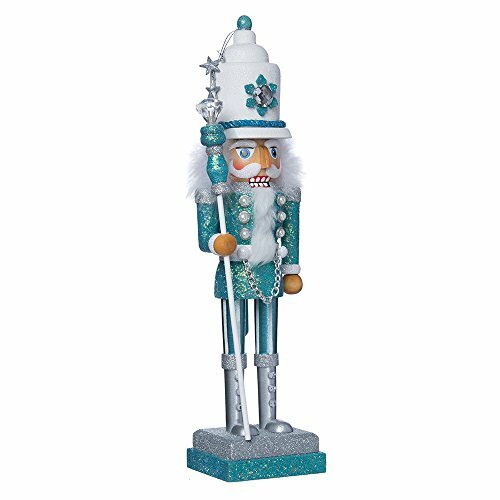 Save 3% on the Kurt Adler Hollywood Nutcracker, 17-Inch, Turquoise/White (HA0152) by Kurt Adler at Two Clock. MPN: HA0152. Hurry! Limited time offer. Offer valid only while supplies last. Designed by renowned artist Holly Adler, Hollywood Nutcrackers is a whimsical collection of nutcrackers created exclusively for Kurt S. Adler, Inc. Designed by renowned artist Holly Adler, Hollywood Nutcrackers is a whimsical collection of nutcrackers created exclusively for Kurt S. Adler, Inc. and features a variety of designs including Christmas, fantasy and everyday nutcrackers. Their designs put a unique, vibrant, memorable twist on traditional nutcrackers. This 17" nutcracker by Kurt Adler has a wonderfully wintry turquoise and white design and color scheme. Extra special details include snowflakes and stars on his hat and a regal gem-topped staff.